Amika is a premium hair care brand, founded by industry outsiders with a mission to inspire a lifestyle of self-expression and hair rebellion. The amika ethos encourages going against conformity and fighting against the mundane, no matter your hair type. Once a primarily professional hair care line, amika began broadening its direct-to-consumer strategy in 2018, including relaunching and expanding its offering with beauty retailer Sephora. While widely used in salons, amika, lacked the same level of attention among its target consumer market and knew that generating brand awareness was key to a successful launch. Secondly, while amika hair tools had been available in Sephora, this relaunch would introduce their hair care products for the first time and reposition the brand on highly sought-after end caps within Sephora stores. Drive in-store and online purchases at Sephora. Access up-to-date insights for all known influencers. Personal details including hair types and colors, influencer birthdates and pets names are also recorded and searchable, making it easy to maintain relationships outside of specific campaigns. We were looking for a platform that was essentially a CRM for influencer management that also allowed us to aggregate our campaign analytics and access the insights we need to properly evaluate influencers, such as their follower demographics" said Chelsea Riggs, Brand President, amika on her decision to implement an influencer marketing technology. "We spent more than six months researching and testing every platform out there and found Traackr fits exactly what we needed." The Sephora relaunch was amika's first campaign supported with Traackr’s influencer performance measurement and analytics capabilities. The social media and influencer team started by assessing their known roster of influencers based on past performance when mentioning amika, as well as, competitive brands and key trends related to their products. 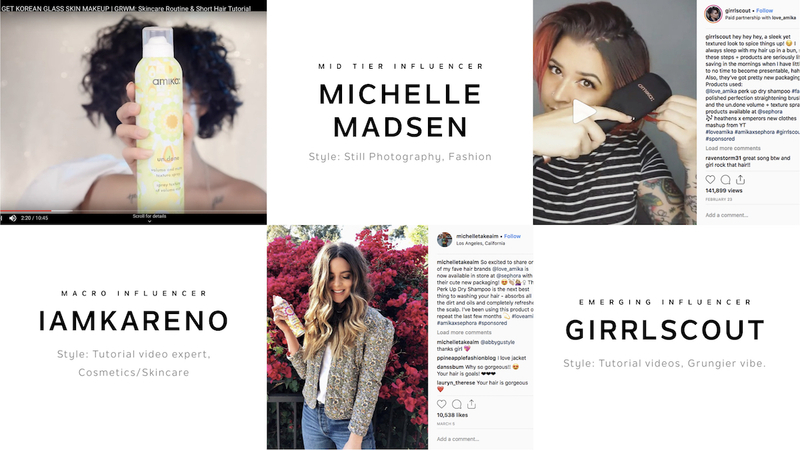 With a limited budget for paid influencer endorsements, the amika team was laser focused on finding the right partners who would resonate with the amika brand and drive consumers to Sephora. Influencer audience insights were used to shortlist influencers whose audiences most closely fit with the crossover between the Sephora shopper and amika buyer. In the end, 10 influencers were selected for paid programs and another group received gifts. ‍For the Sephora launch, the amika team used Traackr’s influencer management, discovery and audience insights features to identify, evaluate and organize influencers into short-lists and campaigns for executive review and approval. Amika partnered with 10 influencers to create launch content that would speak to a range of potential customer personas, including different ages, hair types and creative styles. Here are several examples of the commissioned content and selection criteria. Going into 2018 and a busy year of rebranding and product launches, a core requirement for amika was to implement a solution to aggregate influencer marketing campaign analytics. 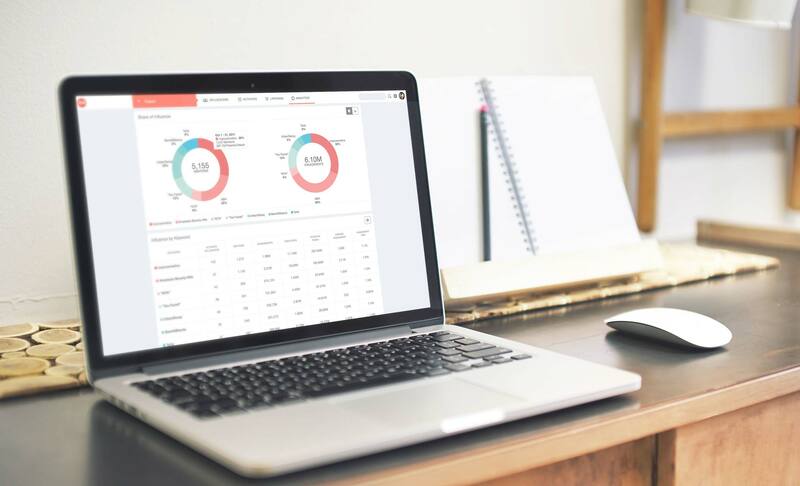 On a weekly basis, amika looks at specific campaign performance indicators, as well as, overall program metrics including the number of activated influencers per tier, potential reach, the number of brand mentions per paid influencer, as well as, organic mentions among non-paid influencers, total share of voice, and influencer response rate. For campaigns, like the Sephora relaunch, amika aligns metrics to the specific goals. These metrics include impressions, new followers on amika’s owned social channels, total engagement, CPM and CPE. Which content formats produce the best results? Which influencers generate the highest engagement rate? Which collaborations result in the most effective CPE? For their always-on influencer programs, amika uses Traackr to benchmark their performance alongside competitive brands among their full influencer roster, including influencers who have not yet been part of their outreach. The resulting insights inform ongoing influencer marketing investments and strategy. ‍For their always-on influencer programs, amika uses Traackr to benchmark their performance alongside competitive brands among their full influencer roster, including influencers who have not yet been part of their outreach. The resulting insights inform ongoing influencer marketing investments and strategy. Amika's relaunch in Sephora was an outstanding success. Not only did amika reach its brand awareness and engagement goals, the strategy directly resulted in exceeding sales targets in-stores and online. When it comes to achieving business objectives, the relaunch campaign was a success. Endcap productivity exceeded expectations and endcap door count is on track to nearly triple within the next year. Another mark of success is that the we’ve seen a significant uptick in the number of influencers who are organically coming to amika and inquiring about working with us.” - Becca King, Social Media and Partnership Coordinator, amika. The ripple effect of this highly curated group of influencers has catapulted amika’s share of influence in the premium hair care category. To understand the impact this influencer marketing campaign had on amika’s launch in Sephora and broader brand awareness, we benchmarked key performance indicators for amika among a sample panel of 36,000 influencers global beauty influencers, comparing the quarter prior to the launch quarter. From a workflow perspective, Sephora relaunch has become a model for amika’s constant drumbeat of product launches and social campaigns, streamlining how the marketing team organizes and coordinates influencer programs. The team now has a data-driven and repeatable framework in place for campaign measurement, long-term relationship building and influencer selection. Amika’s relaunch in Sephora, led by an integrated influencer marketing strategy, demonstrates how strategic planning powered by a powerful influencer analytics and relationship management solution can significantly impact brand awareness, consumer engagement and ultimately drive measurable revenue objectives. To learn more about amika’s approach to influencer marketing, including how the brand structures their marketing team for influencer marketing success, read our in-depth interview with Chelsea Riggs, Brand President, amika on the Traackr blog.